Our client, a multinational company providing security and cash processing services contracted alfrednet for designing and implementing a comprehensive integrated security solution for its new cash processing facility. High performance security solution was required to withstand increased security standards. This can only be achieved by adoption of an integrated approach, with one central command and control room. Security integration: PSIM platform integrating all underlying systems including barcode scanners, weight scale entrance gate, thermal imaging and more. As a component of any nation’s critical infrastructure, railways require increased attention to safety and security. As part of the project, a unified security solution was required to provide centralized monitoring of railway infrastructure assets and operations through establishment of two Operational Command and Control centres. Together with one of our partners specialized in electrical projects, we accepted the challenge to design and deliver the low-voltage systems for a medical centre in Gabon. Custom project delivered together with one of our partners specialized in deploying custom naval communications solutions. The project consists of enabling remote control of the onshore command centre to monitoring 4 naval miles away sea beacon. The beacon is controlling industrial installation in an hazardous environment. The onshore command centre shall be able to real time video monitor the installation and also to perform some remote actions upon the installation. Alfred Net was chosen to design the solution architecture and deliver an integrated video surveillance solution that match the operational requirements of railway infrastructure company. As part of a complex signalling project, video surveillance has to withstand several criteria in order to deliver the functionalities required by the end user. Proposed architecture is designed as a multi-site application, covering recording capabilities at every railway station as well as centralized recording and archiving at central station where a command and control room manages the rail traffic for 50+ kilometers of railway. The system consist of 100+ high definition cameras positioned in key points of the railway sector. 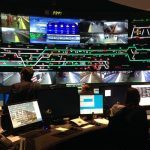 With an average of 30+ cameras per station, the solution provide real time monitoring for all level crossings, stations ins and outs, platforms and passengers passages as well as signalling and telecommunications cabinets across the rail line. Video surveillance system collects alarms and events from access control, intrusion detection and fire detection systems. Therefore, every such event or alarm is associated with the appropriate video camera and provide the operators real time video confirmation of events.